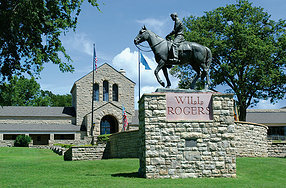 Recently while we were in Claremore Oklahoma we visited the Will Rogers Memorial. Here is an exterior view from the web. Will Rogers was born nearby in what was Indian Territory in 1879. An expert cowboy and rope trick artist he started out in Vaudeville. Then it was on to the Ziegfield Follies. From there it seemed there was nothing that Will Rogers was not involved in. He starred in silent movies then talkies while also writing a daily newspaper column. Tragically Will Rogers was killed in an airplane crash in Alaska in 1935 and buried in California where he lived at the time. After much discussion as to the location of the memorial it was decided that Claremore would be the site on property purchased by the family about 20 years earlier. 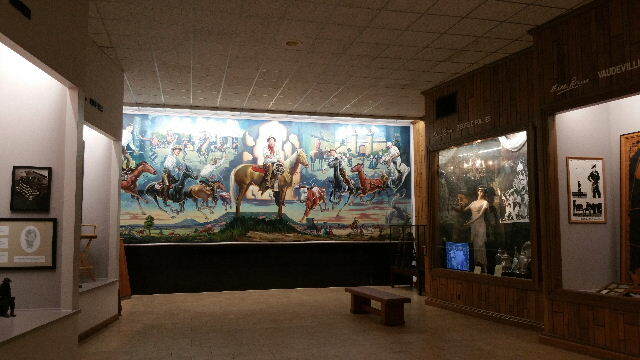 This is what greets you at the entrance. We first saw a great documentary in the theater. 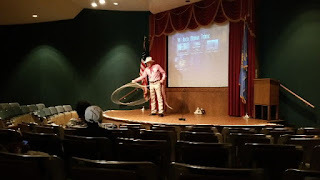 When that was completed a storyteller took the stage and told some of the history and did some rope tricks that Will Rogers was famous for. 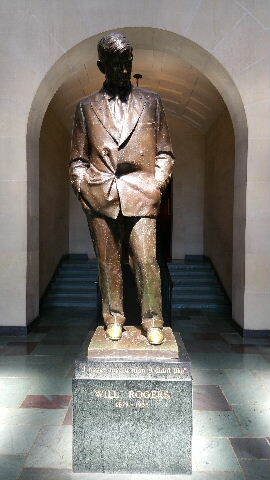 A copy of the statue that is in the National Statuary in Washington DC. 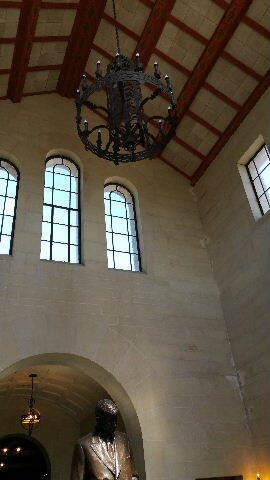 We really liked the chandelier above the statue. As mentioned before Will Rogers was originally buried in California in 1935. 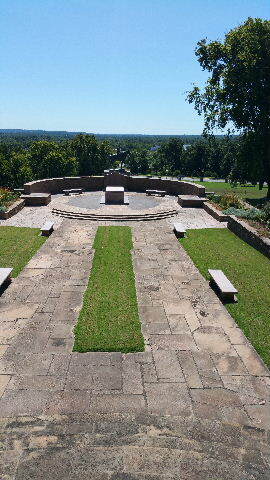 In 1942 his body was moved to Claremore. 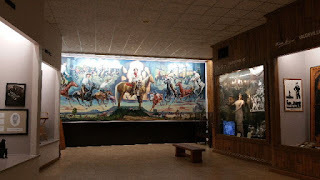 He was joined by his wife in 1944 and various family members since then. judgment comes from experience, and a lot of that comes from bad judgment. We'll end with a couple of our favorite quotes that are still relevant these days. "Do the best you can, and don't take life too seriously." 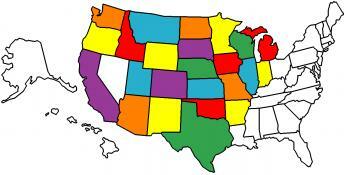 "Never blame a legislative body for not doing something. When they do nothing, they don't hurt anybody. When they do something is when they become dangerous." 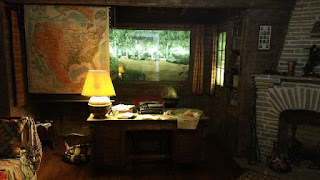 I think the storyteller would be such a great addition to the museum. 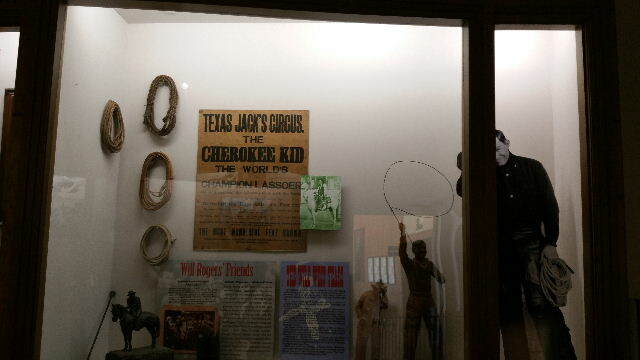 I love watching rope tricks at the Houston Rodeo. I can't image how much time it must take them to learn and perfect the tricks. THat is a place I would like to visit. 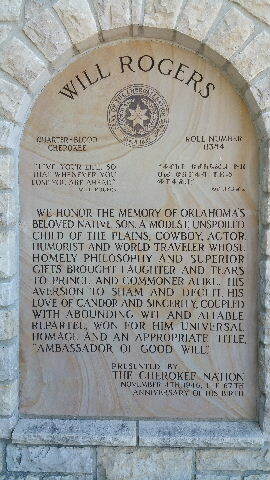 Lived in OKC for four years many years ago, did not know about this memorial. Full-timing in our Lifestyle LS38RS somewhere in this great country, God Bless the USA! !